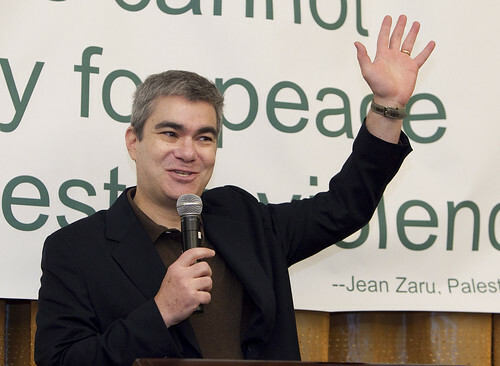 Rabbi Brant Rosen, leader of Jewish Reconstructionist Congregation in Evanston, Ill., addresses a press conference sponsored by the United Methodist Kairos Response during the 2012 United Methodist General Conference in Tampa, Fla. The group is calling on The United Methodist Church to divest from companies that profit from the Israeli occupation of Palestinian territories. A UMNS photo by Mike DuBose. Click on image to enlarge.View more photos. 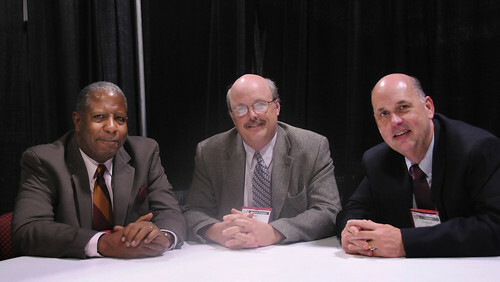 Two advocacy groups with representatives at the 2012 United Methodist General Conference are focused on improving life for Palestinians in Israel and the Occupied Territories. But they differ in their strategy on how to best support the church's official opposition to the continued Israeli military occupation of the West Bank, Gaza and East Jerusalem. Both claim backing by Jewish supporters. United Methodist Kairos Response is promoting the adoption of a proposed resolution, "Aligning United Methodist Investments with Resolutions on Israel/Palestine," submitted by the United Methodist Board of Church and Society. The legislation calls for all boards and agencies "to divest promptly" from three companies whose products are used in the occupation - Caterpillar, Motorola Solutions and Hewlett Packard. United Methodists for Constructive Peacemaking in Israel and Palestine seek "positive investment in Palestine" and warned in a letter to delegates that any General Conference proposals for divestment or boycotts "will only increase the fear and mistrust that exists on both sides." Although that group, also known as UMCPIP, submitted no specific resolutions to the denomination's top legislative gathering, it favors the language used in positive investment resolutions approved by the Virginia and North Carolina annual (regional) conferences in 2011 as a substitute measure. During an April 24 news conference at the Marriott Waterside Hotel, Kairos Response offered brief testimonies from Palestinian, Jewish and United Methodist speakers about the need to support a call from Palestinian Christians for selective divestment of companies considered to profit economically from the occupation. The Rev. Alex Awad, a missionary with the United Methodist Board of Global Ministries based at Bethlehem Bible College, must pass through Israeli military checkpoints every day to travel between Jerusalem and Bethlehem. Over the years, he said, he has witnessed the demolition of Palestinian homes, the confiscation of Palestinian land and the building of the separation wall. He agrees with other Palestinian Christians that it is time "to stop investing in businesses that bring injustice." Rabbi Brant Rosen, who leads a Reconstructionist Jewish congregation in Evanston, Ill., said he has identified with Israel "pretty much my entire life." But after getting to know Palestinians as individuals, visiting their communities "and seeing, face to face, the intolerable situation on the ground," he supports the action advocated by Kairos Response. "If you're out to create real and lasting change, engagement is not enough," Rosen said. "That is why something like selective divestment is so crucially important." Los Angeles Area Bishop Mary Ann Swenson, who has traveled to the Holy Land many times over the past 20 years, called her journey there with an ecumenical group of women bishops last November an eye-opener. She compares the situation in Israel/Palestine with the segregation she witnessed while growing up in the state of Mississippi. Those involved in UMCPIP agree that the situation for Palestinians is difficult. "We don't want to understate or look past the real suffering that is going on," said the Rev. Alex Joyner, a clergy reserve delegate from the Virginia Conference, in an interview. "Everybody on both sides of this issue wants the same thing," added the Rev. Chappell Temple, a clergy delegate and pastor of Lakewood United Methodist Church in Houston. and Chappell Temple. A UMNS photo by John C. Goodwin. Click on image to enlarge.View more photos. Instead of divestment, however, UMCPIP supports substitute legislative language that would promote assistance toward a sound economy and infrastructure as "necessary and positive steps that must be taken towards Palestinian state-building, and they can improve the lives of Palestinians even under the current situation." Although they have not made specific recommendations, the group is aware of the possibilities for economic intervention. "A number of us have traveled in the region and have seen there are opportunities in the Palestinian economy for development to take place," Joyner explained. Temple suggested that farm cooperatives and ventures, such as the Palestinian olive oil sold by Equal Exchange, a United Methodist partner in fair trade products, are examples of those economic opportunities. Substitute language for any legislation, the group said, could affirm the fact that the 2008 General Conference did not support divestment petition strategies to "help bring about an independent, sovereign Palestinian state as well as peace, prosperity and security for both Palestinians and Israelis." The church could commit to making recommendations "for concrete measures" that can be taken by United Methodist entities and individual members "to encourage, aid and assist the Palestinian people in their efforts in nation-building." Noting that grinding poverty can push people to desperation, the Rev. Clarence R. Brown, Jr., a delegate from the Virginia Conference, said helping develop the economy "allows for local people to get meaningful employment or employment-period." Dalit Baum, an Israeli peace activist, is not convinced the Palestinian economy can improve much under the current circumstances. Privatization of the occupation since the 1990s has highlighted "the harmful role corporations play in this conflict," she said. Hewlett Packard, for example, one of the companies listed in the resolution, designed the information system for the military checkpoints, Baum said, and those same checkpoints "destroy the Palestinian economy" by greatly hindering the movement of goods. That is why she believes divestment, even of minimal levels of stock, could have an impact. For some corporations, the loss of a good reputation is enough. "As an activist on the ground, I feel this is an effective tactic for actual change," Baum explained. The proposed petition on aligning investments with resolutions, along with a few other petitions on the subject and any substitute motions, are being considered by their assigned legislative committees this week at General Conference. The committee's recommended action will be considered by the full conference sometime during the week of April 30.